George Graham Reviews The David Zoffer Differential's "Release"
With so many recordings appearing on the music scene, it's not easy to be different. After all, no matter what you do musically, it's probably already been done before, and most likely better. But the quest for originality has also led to a kind of explosion of eclecticism in recent years, resulting in a cornucopia of interesting and creative music, largely under the radar of the commercial music industry. That eclecticism usually comes through the introduction of unconventional combinations of instruments or styles, and sometimes both, with mixtures of disparate styles bringing along their respective instrumentation. This week's CD is full of highly dintinctive and original-sounding music that features instrumentation about as conventional as one can get: electric guitars, keyboards, bass, drums and vocals. But the result is a quite fascinating and engaging. 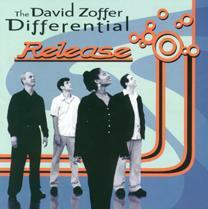 The group is called the David Zoffer Differential, and their new release is called Release. Their somewhat jazzy sound, with complex convoluted tunes and lyrics that are pages long hints at an academic background for the players, and indeed Boston resident David Zoffer has been chairman of the New England Conservatory's Prep and Continuing Ed. Jazz department for more than ten years. He also teaches at Tufts University and the Rivers Music School, as well as serving as guest lecturer in improvisation and composition around the world. He plays keyboards, guitar, bass and does vocals. This is actually his third CD, but the first with this particular band. On Release he is joined by Jamie Stewardson who trades off on guitar and bass depending on what Zoffer plays. Stewardson also plays on tours with classic Motown stars. The drummer is Eric Doob, who often performs with Latin jazz groups, including with Dave Samuels. Rounding out this group is a singer who goes by the name Rajdulari. Instead of having a single lead vocalist, the Zoffer Differential features Zoffer and Rajdulari as a duet on every song, not so much singing harmony as having an elaborate dialogue. Every song on the CD is written and performed essentially as a conversation. And to make that possible, the compositions are complex, convoluted, with constantly shifting moods and colors, written in a kind of long linear fashion, with very little of the familiar verse, chorus form of pop music. It can be reminiscent of a kind of mellow, slightly jazzy Frank Zappa. The excellent interweaving vocals and the very sophisticated tunes, but with sparse instrumentation makes the CD stand out immediately. And Zoffer's songs are remarkably wordy. The lyrics take up nine pages of small print in the CD booklet. Zoffer describes them at one point, as stories. But they are less narrative than musical essays. The David Zoffer Differential's new CD Release is a fascinating recording that uses good old fashioned composing and arranging to create music that employs conventional rock band instrumentation, yet sounds unlike just about anything else on the pop scene these days. The dual lead vocals, arranged as a conversation, further enhances the sound of Release. The musicianship is first-rate and the vocals, in addition to being really interesting, are also outstanding. It takes good singers to be able to perform this kind of material. The only drawbacks are that sometimes Zoffer are company get a bit too musically convoluted, and it can sound more like an academic exercise than fun music. Our grade for sound quality is an "A." There is a minimum of studio effects, and that helps put the musicianship front and center. The there is also refreshingly little volume compression, so that the music's dynamic range is commendable. What to call the David Zoffer Differential's music is a challenge, since it does not fit any category neatly. I suppose that "art rock" might be as close as any. As such, it's probably not likely to appeal very much to those who like their rock loud, simple and repetitive. But for those with a taste for the unconventional, the CD is very impressive.